On October 2 through October 8, 2016, John Climaco of Park City, Utah, shared some photos and stories about his time traveling and climbing abroad with the #alpinistcommunityproject. The 47-year-old has been climbing for 37 years all over the world and now considers himself lucky to be taking his kids to the mountains. The Caroline Face of Mt. Cook (3742m) in New Zealand was my first exposure, literally, to a major alpine face in 1992. When Chris Breemer and I stepped off the east ridge we could look down 5,000 feet to the base of the face, and up another 2,500 feet to the summit ridge. It was one hell of an introduction to serious alpine climbing. 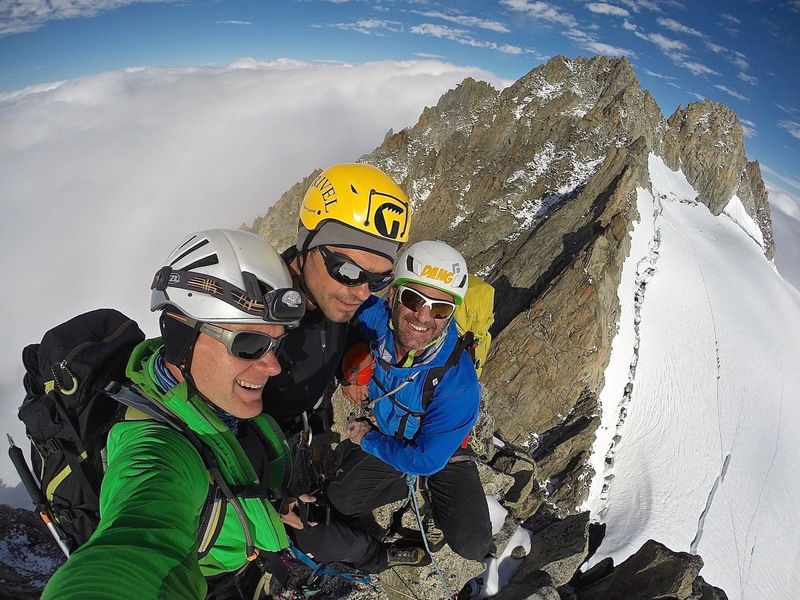 Last year I climbed the Aiguille Purtscheller (3478m), a Grade II 5a (5.8) spire on the France-Switzerland border, with some Russian guys I'd just met the week before on the Aiguille de Midi (3842m). They basically spoke no English. I spoke no Russian. Belaying and such was a comedy. Good thing the climbing was easy. 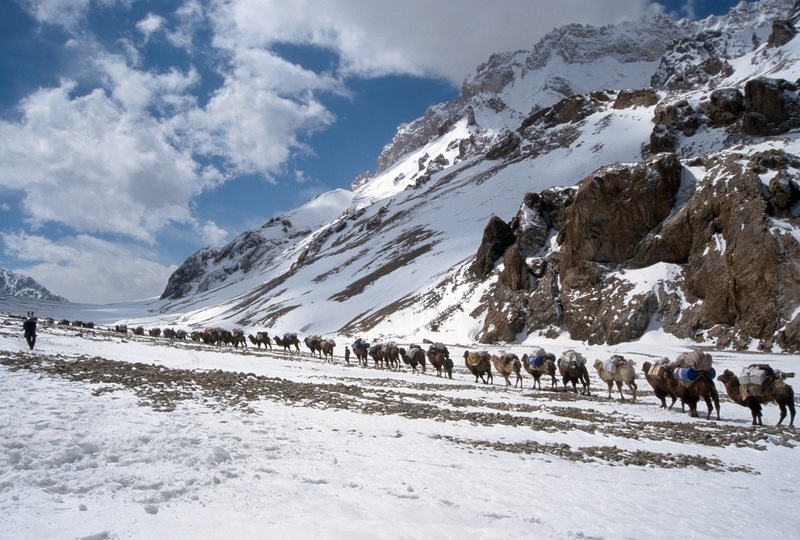 Camels on the Aghil Pass (4805m), Karakoram Range, China: We had 45 of these smelly, loud, constantly puking beasts to carry a month-and-a-half of gear and supplies into Shaksgam Valley. We were the only people in thousands of square miles. In the pre-Google Earth era of 1999, all we had to go on were some 70-year-old trip reports and a Russian military map we couldn't read. It was the kind of adventure I'd dreamed about as a kid. During the trip we made the first ascent of a peak that was about 5800 meters high near the Indira Col and the disputed border with India. No one had been that way since Ardito Desio mapped the area in 1929. 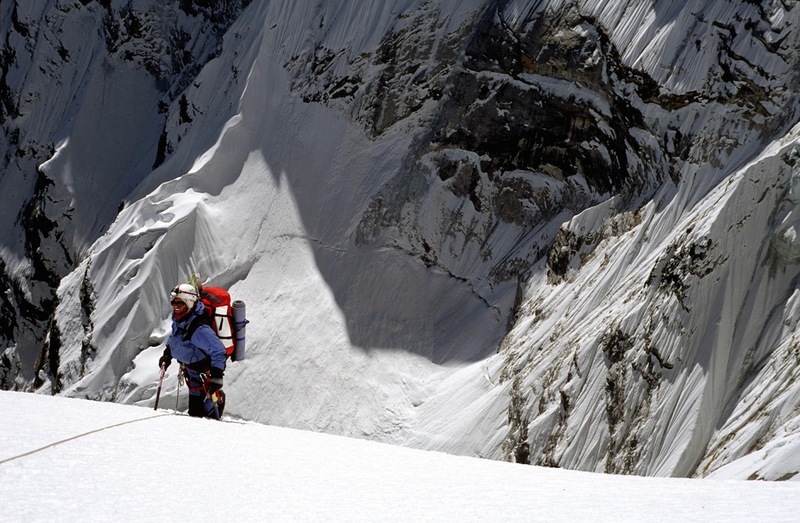 Desio later went on to lead the expedition that made the first ascent of K2 (8611m). We named the peak Desio. 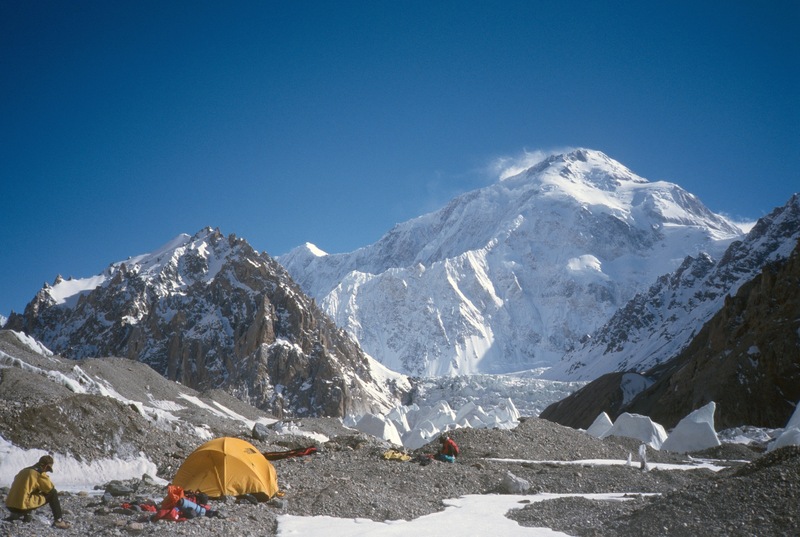 Back at base camp our expedition teammate Kurt Diemberger suggested we contact Desio. We couldn't believe he was still alive. When we reached him on the satellite phone he was fully lucid at 102 years old. He invited us to visit him in Rome, which we did after the trip. Since he was a geology professor, we brought him photographs and rock samples from his peak. I remember he stared at the photos for several minutes in silence and then said, in perfect English, "Seeing you here is like seeing my youth walk through the door." Chris Breemer and I did a recon of the east ridge of Hidden Peak, or Gasherbrum I (8080m), from Urdok Glacier. It's over 12,000 feet high and I believe it's still the largest unclimbed feature of any 8000-meter peak. Only a few teams have even seen it and only one has attempted it. Now that I've showed it to you, just don't go without me. 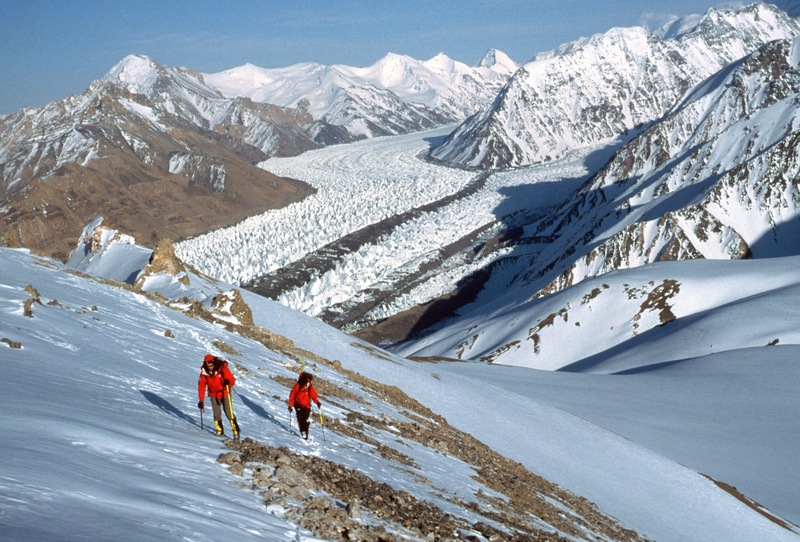 Chris Breemer and Pemba Sherpa make their way up an unnamed 6,000-meter peak above the massive Singhi Glacier in the Karakoram Range. No one had explored this place since Thomas Mason in 1926. Nothing in the photo has been climbed to my knowledge. 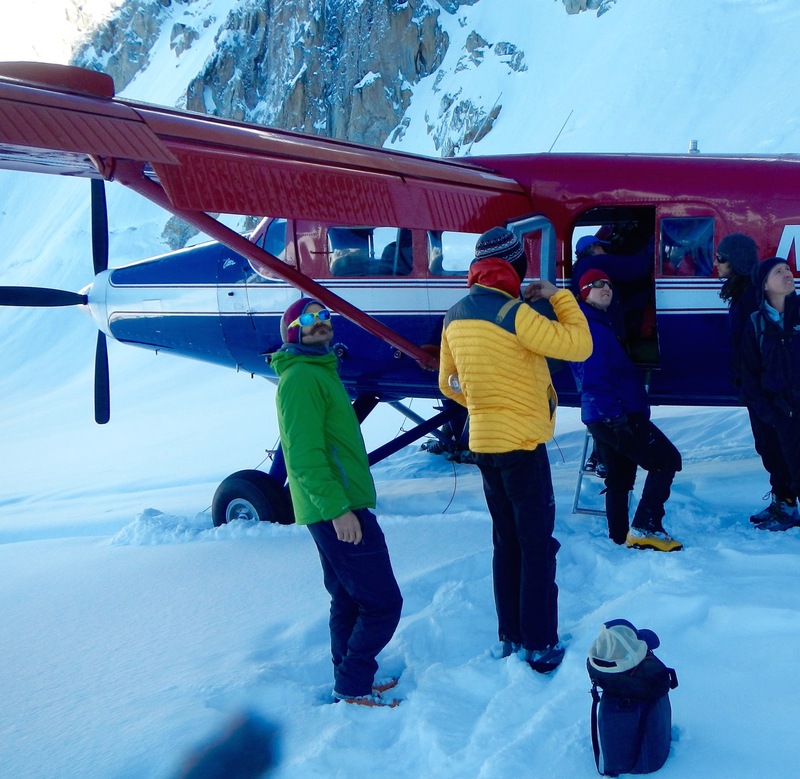 In 2014 a serac collapse had closed the landing zone on the Root Canal Glacier and dashed our plans to climb The Mooses Tooth (10,300') in Alaska. At the Talkeetna airport we saw a poster of Mt. Huntington (12,241') and decided to try that. Scott Adamson was on the flight with us and was kind enough to point out our route—it was so much bigger than it looked on the poster that my partner and I didn't recognize it from the base! When we staggered back a few days later after climbing it, Scott marched out through thigh-deep snow to greet us with hot food. He was such a kind and modest guy. Hard to think that he's gone now. 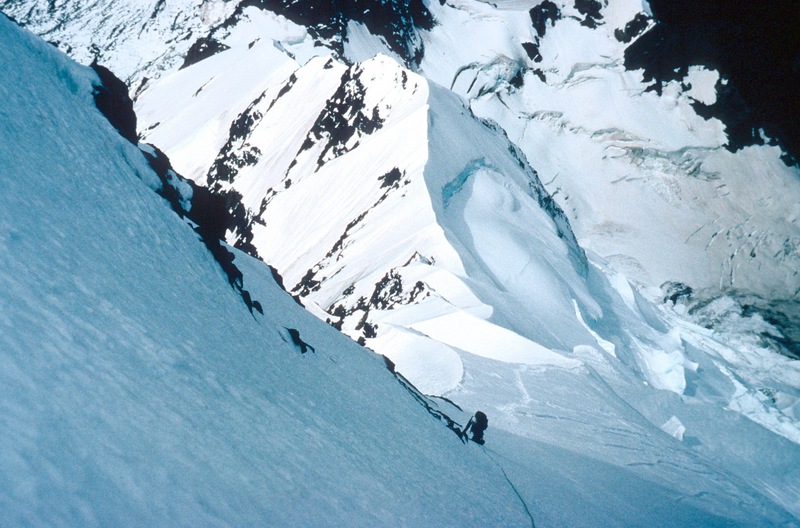 Andrew Brash, Chris Breemer, Robert Cassady and I made the second ascent of the Southwest Ridge of Cholatse (6440m) in the Khumbu region of the Nepalese Himalaya in 1993. In this photo I'd just fallen to my knees after climbing to the summit plateau through the night because we were concerned about the warm conditions.